The two main types of tumblers are rotary tumblers and vibratory tumblers, and both are used extensively in parts finishing and polishing operations. A tumbler can come in many different sizes depending on its intended application. Tumblers for stone polishing hobbyists will be smaller than those used for industrial parts cleaning. Tumblers are barrels with a plastic or rubber lining that is typically removable for easy cleaning or replacement. Lining the barrel helps to reduce the noise produced by tumbling or vibrating. Tumblers use tumbling media or deburring media in the process of finishing in order to create friction with the unfinished metal or plastic parts, jewelry, rough stones etc. Common types of abrasive media include steel, plastic pellets, ceramic particles, walnut shells and corn cob media, which all have different levels of hardness and abrasion. When the abrasive media is placed inside the barrel, the friction created by the motion of tumbling helps to burnish, polish and clean the parts’ surfaces. Industrial manufacturers use rotary tumblers with wet media for mass parts cleaning, polishing and cement mixing, while vibratory tumblers are used with more abrasive media for mass finishing and deburring. Rotary tumblers are hexagonal or cylindrical tubs that spin horizontally, causing the parts and tumbling media to mix and be cleaned, polished and deburred. The speed of rotation depends on the size of the barrel, and the hardness of the materials, and the level of finishing desired for the parts. 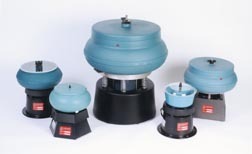 Vibratory tumblers use the motion of vibration to cause friction between the abrasive media and the parts. A cyclonic downward motion is caused by the vibration, and the resulting friction causes deburring and polishing. Construction of tumblers needs to be considered in light of barrel capacity, both in terms of load and volume and engine size and the resulting speed of motion or vibration. Tumbling can be a long process and therefore it is important that the motor responsible for the tumbler is able to handle continuous duty. Motors often come with a cooling option to avoid overheating. Tumbling can be a dry operation, or a lubricant such as water can be added to encourage polishing. In which case, tumblers will have a drainage capability to allow for the removal of the liquid and grit. Although small rotary and vibratory tumblers are largely becoming the tools of hobbyists, industrial parts manufacturers and machinists still use tumblers for mass finishing and cleaning. Tumblers Tumblers are one of the main components of finishing equipment and deburring equipment, the barrel or drum in which the objects to be finished are placed.